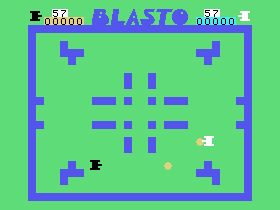 TRIVIA: This game is a port of the 1978 Sega/Gremlin Arcade game Blasto, making it one of the earliest Sega arcades brought to the home. The game itself is pretty much identical to the Sega/Gremlin original, except for the alteration to the battle vehicles. In the arcade, you "drive" spaceships on a type of space minefield. Apparently, Milton Bradley thought it would make more sense to the public (and perhaps sell more copies) if the game took place on a minefield, where the player would control a tank. Personally, I think the space theme was more unique, but can understand the change that arose most likely due to marketing reasons. Still, a faithful arcade translation by Milton Bradley. TRIVIA: This game would be the first programming job done by Robert S. Harris (AKA RoSHa) before going on to create games for the Odyssey2, his most famous title being the well-known Killer Bees! According to Bob, this game was first started by Elaine Henshon, but for unknown reasons she stopped working on it. He speculates that the reason for this was because Elaine was busy working on 3 other TI-99/4A titles at the time for Milton Bradley, and could not meet the upcoming deadline for the project if she was working on 4 titles all at once. TRIVIA: The European Manual for this game incorrectly states the product number as PHM 3023, when it should be PHM 3032. As seen in the European manual scan below, someone crossed this error out and fixed it themselves. TRIVIA: Interested in playing an updated version of Blasto right on your own PC? Thanks to a TI-99/4A gaming enthusiast you now can! 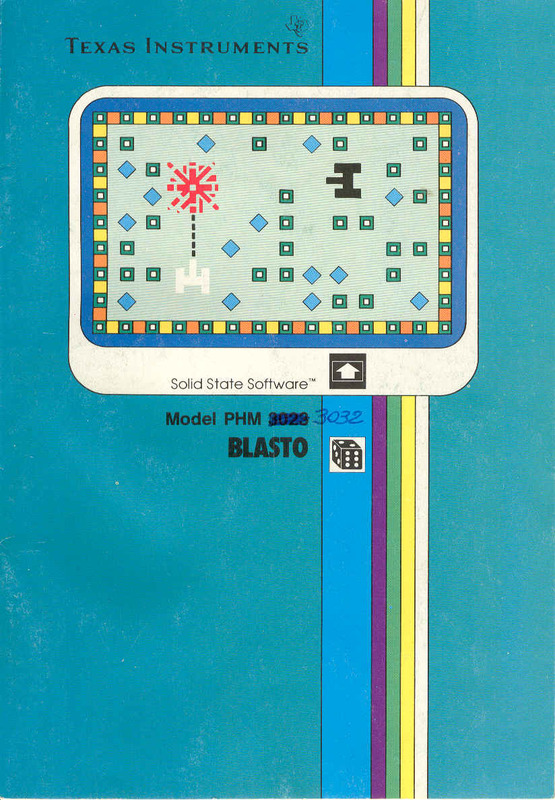 The revised game is called Blasto 3D (<-- Link) and is very faithful to the TI-99/4A conversion of the Sega/Gremlin arcade. The only sad news is that it is for PC only and not Macintosh. Hopefully in the future it will be ported to the Mac, but for those who use PC's I seriously recommend you download and give this game a try. 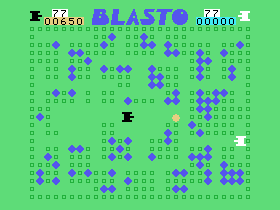 Blasto 3D is a remake of the classic Blasto from the TI-99/4A. New realistic 3D sound effects. -Red mines, more powerful than blue mines and worth more points. -Mines have hit points; sometimes you need to hit them more than once. -Random power-ups that sometime spawn when a mine (any mine) is triggered. -Weapons (taken as power-ups): the tank shell (from the classic), the machine-gun (higher rate of fire, less damage) and the missile launcher (radius explosion, really slow). -Other power-ups include: speed boost/decrease, invulnerability, bulldozing (lets you go through mines and make them explode), time bonus/penalty, score bonus, mine spawn, weapon reload time increase/decrease, air-strike, a-bomb.